Our son is obsessed with geography. Looking back, I think it started with a road trip between Nebraska and Missouri the summer before he entered kindergarten. He was contained in a car seat for seven straight hours, but thanks to a few road maps and a U.S. atlas he was as happy as tourist with a shiny new Canon. He spent the entire drive quizzing us about states and capitals, and took sick delight whenever we got one wrong. There were also red flags in kindergarten, when most little boys were drawing dinosaurs and monsters. Sam spent the entire year drawing maps of the continental United States. Freehand. From memory. 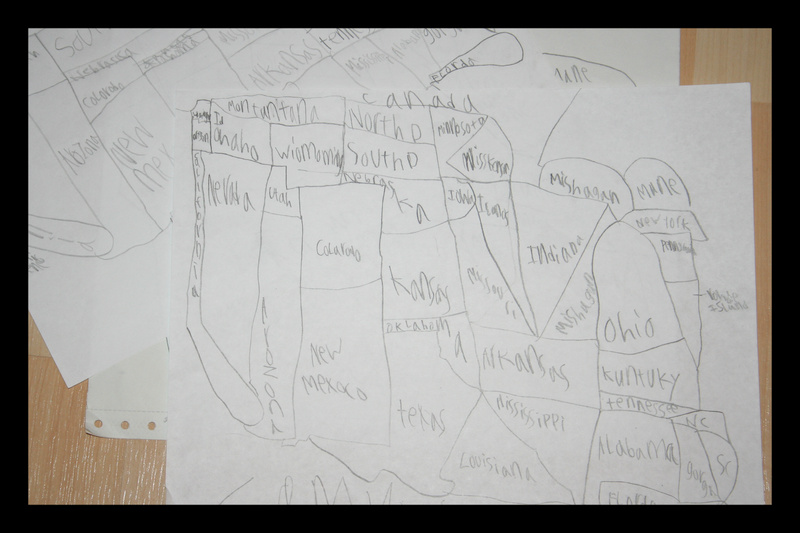 In second grade he transferred to a new school, where there was no longer class time for him to draw his beloved maps. But halfway through the year a teacher started asking geography trivia questions on the morning announcements, and Sam was hooked. He told me about them every afternoon. “Is it like a bee?” I asked. He wasn’t sure what I meant, so I explained the basic premise of how the geography bee worked in my middle school. Kids study geography questions, enter a school contest, and the winners go on to a local and then national competition. His eyes twinkled as I explained the process. In hindsight, this was another sign. A few days later he came skipping off the bus, his little heart clearly bursting with excitement. Yes! There was geography bee at his school! And, even more exciting, his class had elected him as their representative. Of course they did! How serendipitous that the questions were always topics he knew through personal experience. He also gave us a daily report of how many kids answered correctly, keeping careful tabs on his competition. By the second week, the numbers had quickly dwindled. The competition came to a head right before Thanksgiving break. The contestants had been narrowed to two: Sam, the lone second grader, and a boy named Len, a sixth grader. A sixth grader! Apparently Len had just moved to Alaska from Texas. The judges decided to alternate questions about each of the boys’ birth states, and the final round would be held the Monday after Thanksgiving break. This would give both boys plenty of time to study, and as a result Sam spent half the holiday weekend reading stats about Texas in his almanac. But it was still a holiday. We called all of Sam’s grandparents, wishing them a Happy Thanksgiving and passing the phone around our long distance dinner tables. They were so proud to hear about Sam’s geography bee accomplishments, and anxiously awaited his call after Monday’s competition. Our own Thanksgiving dinner was festive, with friends toasting Sam’s achievements and predicting his win. Sam still had that twinkle in his eye. I could see him dreaming. He studied ferociously all weekend, and we assured him that we were proud no matter what the outcome. After all, he was only a second grader! He was competing against a boy four years older! The Monday morning of the big finale, I sent an email to his teacher. She had been on vacation the previous week or I would have written earlier. So that is weird, huh? Minutes later he came bounding off the bus. He was running and floating and skipping all at once, buoyed up by a giant grin. “I won it! !” he beamed. I wanted to lift him up, to dance and spin and scream with him. But there was this looming sense of doubt growing in my soul, so my celebration was subdued. “What was the winning question?” I asked skeptically. “Where does Alaska ship its oil?” he replied. Apparently Sam knew that the answer was California, but Len had sadly said Texas. Hmmm. Was that even correct? I kept playing along as we drove home, where I immediately dug out the school directory. I scanned the pages of sixth graders multiple times. When Clark got home we probed Sam about his geography bee experiences. Who asked the daily questions? He said someone named “Mr. W” quizzed kids at lunch. Why wasn’t Len in the student directory? He didn’t know. We were skeptical, he was defensive. We had questions, he had tears. More correspondence with his teacher revealed further details. Mr. W, it turned out, was the school’s janitor. He saw the students in the lunch room, but certainly did not have time for contests. While we wondered about this Mr. W. character, Sam’s teacher became paranoid about a stranger at the bus stop. Sam had told her that a man at the bus stop was quizzing kids about geography every afternoon, so she immediately called to warn me. I assured her that there was an army of mothers, including myself, who met our children at the bus stop each day. No strangers. No way. I’m not a naive parent. I know that most children will experiment with lying. Since their birth, I’ve been preparing for my kids to claim, “Yes, Mommy, I brushed my teeth!” One whiff of their non-minty breath and I would march them back to the bathroom, rasp my fingers along their dry toothbrush, and exclaim, “Oh no you didn’t!! !” before sending them to bed with both guilt and cavities. Lying wasn’t something that would phase me. But this fictitious geography bee threw me for a serious loop. My seven year old had invented not only a contest, but also the questions and contestants. I took solace in the fact that his enormous lie stemmed from fantasy rather than malice, but I still spent the next week googling phrases that started with “pathological.” Let’s just say I was concerned. As a consequence, we made Sam call and “untell” three of the people he had lied to. It wasn’t easy, but most of them helped us out by keeping a straight face through his confession. His token line was, “It was a little bit of confusion and a little bit of lying.” Ummm, a lot of lying, buddy. This lying could get innocent bystanders – like a kind-hearted school janitor or a random man walking his dog at our bus top – in serious trouble. And that is seriously not okay. Sam understands that now. Like I said before, we as parents see the best and worst in our children. Of course we want to share the best, to brag about them in our holiday letters or at family dinners and PTA meetings. But honestly, it would help if we’d share our struggles, too. We all have them. Our kids are going to make mistakes, and life would be much easier if parents, teachers, neighbors, and coaches would band together. Instead of feeling threatened and defensive when someone tries to steer our kids back on course, it would be nice if we’d show an ounce of gratitude. We are all on the same team, right? Ultimately, we have the same goal: turn these children into kind, intelligent citizens. After all, it takes a village. Not an island. Our child invented not only a geography bee, but also a nerdy new student from out of state and enough questions to fill a 30 minute TV quiz show. What’s worse, he lied to half his family in the midst of a major holiday celebration. People throughout the Midwest were praying for him over their Thanksgiving turkey dinners. Don’t leave us on that island alone. We needed help. We needed parents and teachers who would refrain from judging us, but instead laugh with us, cry with us, and more than anything help us get that child back on track. Because he’s a great kid. And we wanted to get back to celebrating that fact. Celebrating him for who he will ultimately grow into. To bee.